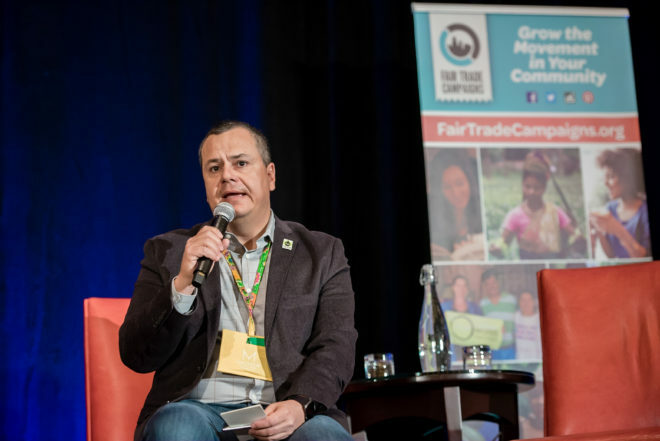 The 2019 Fair Trade Campaigns National Conference began in the best of ways: a rapid-fire lineup of speakers from the Fair Trade, conscious consumerism, social impact and anti-human trafficking movements delivered rousing speeches. Later on, we heard from Fair Trade USA CEO and founder Paul Rice, who left the audience in awe after recounting how the organization came to be and what he hoped for its future. To me, one of the most interesting parts of the weekend was the presence of producer voices and those of Fair Trade workers in the field. 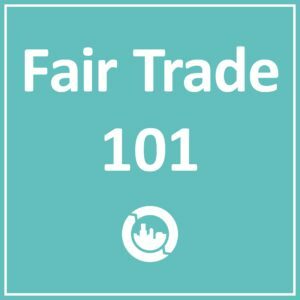 Though we all love and care about Fair Trade, the producer perspective can be easily overlooked. There were two people that stood out to me from breakout sessions, and I will speak about them in turn: Claude Toty, a Farmer Lead Trainer in Côte d’Ivoire, and Jaime Tamayo, Chief Operations Officer of Divemex, a Mexican company that grows and exports colored peppers to the United States and Canada. Claude Toty spoke in the Fair Trade 101: Impact session. He drew from his own experiences working directly with cocoa cooperatives in Côte d’Ivoire to support and train them on Fair Trade certification and implementation. 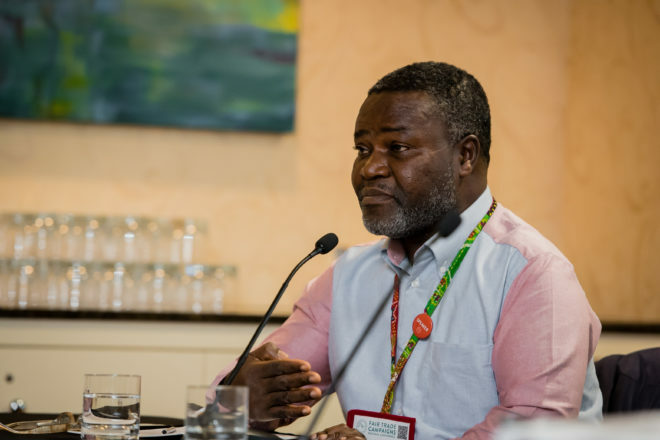 Claude works with 6,500 cocoa producers in 10 different co-ops, providing trainings on the Agricultural Production Standard, leadership skills, and roles and responsibilities of certificate holders, among other topics. Though it may sound straight-forward, there are a few complications. The first is that there are around 78 languages spoken across the country, so many of the farmers do not speak common languages and also cannot read, making his work all the more difficult. Claude must also travel an average of 300 kilometers from farm to farm, on primarily unpaved roads. Divemex has greenhouses in a number of locations spread throughout Mexico. One farm site is experiencing more regular hurricanes, a phenomenon that never used to take place. Another is dealing with increased temperature fluctuations, making it more difficult to regulate proper growing conditions. Each location faces unique environmental challenges as a result of climate change. The Fair Trade premium has allowed Divemex workers to invest in infrastructure to protect against these harsher weather patterns. On a related note, it has opened the door to pollinator conservation, an effort that involves identification of native pollinators in each growing region and formation of steps to preserve their populations and promote growth. It was truly enlightening to hear from these two speakers, as well as other ground-level and producer voices. Although the Fair Trade movement is really about them, it can be easy to get so caught up in our organizing and logistical work that these integral perspectives get pushed to the wayside. 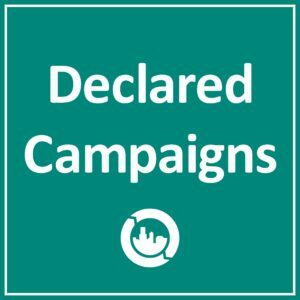 The 2019 National Conference exceeded expectations by creating space for these individuals to share their experiences. The entire weekend was both informative and inspiring, and I hope to see you there next year! More information about the 2020 National Conference coming soon. Noah Gorovitz is the Fair Trade Campaigns Intern for Spring 2019. He began working with Fair Trade as a member the Berkeley High School Fair Trade Campaign during his time as a student there. Noah has taken a year off from college to transfer, and hopes to continue his involvement with student activisim wherever he goes!